OSDev.org • View topic - What IDEs are you using? What IDEs are you using? Post subject: Re: What IDEs are you using? Isn't a "text editor with syntax highlighting" an ide in a way? IDEs have integrated tools for debugging code and invoking compilers/interpreters. GNU nano and TextWrangler for macOS do not have these features. TextWrangler does have a run button for scripting languages which interprets the "#!/bin/whatever" at the top of the file and runs /bin/whatever on the source code. But that is just a little utility and does not make it an IDE. I am using Eclipse CDT on a linux machine to build my (Silcos) kernel. Depends on the kind of work. For low level hacking IDEs rarely make sense. A terminal with fasm, and joe editor with either GCC or Fabrice Bellard’s TinyC (the later is fun to mess around with, GCC’s source code seems too intimidating to play with ). I use MonoDevelop/Visual Studio when it comes to prototyping things or game development, since I’m comfortable with C# and MonoGame. I recently started learning python, after getting to know about SAGE as a (still incomplete) replacement for Mathematica which I worked with for quite some time. SAGE with Jupyter does a good job a replacing Mathematica. I use kdev (KDevelop) as my primary source IDE usages. But I am required to use the terminal to build things, since I can never figure out how to setup my own custom stuff the way that I'd like to using that thing. So it's kind of a double-setup IDE, I guess you could say. I use vim, in terminal or graphically, for everything. It has builtin compiler support (":mak") and syntax highlighting. And runs on anything electrons can flow through. At work I'm forced to use IDEs to run the compilers, but I still use vim for editing. At home, make is my build system. Yes, about that... I had a similar question to the thread's title asked by a prospective new employer. "I can't see from your CV which development environments you've worked with." "Command line, mostly. There, that line about 'technologies'? Vim, Make / CMake, GDB. Because we were working on various Unix-based servers..."
"V.... what? Vim? Never heard of it." Next thing he asked me, if I'd ever worked with "problem reporting software". (He meant bugtrackers.) Apparently he took me for a caveman because I hadn't worked with Visual Studio or Eclipse. The "funny" thing is, reputedly this company specializes in Embedded C++. But he's never heard of Vim. Like, at all. I am not at all sure I still want that position at his company. Some people have heard of "VI" but not "VIM"... Bu realistically you can't expect everyone to know about VIM today. Last edited by kzinti on Tue Jan 15, 2019 4:34 pm, edited 1 time in total. Eclipse CDT works very well with a little configuration. Oh wait, you're serious. Let me laugh even harder. Seriously though, Eclipse is the bane of my existance. I have to use it at work and it is so much trouble to get anything done. And it's slow as molasses, every single click requires a second before it registers. Using Eclipse is what made me appreciate using Delphi back in the day. There must be something seriously wrong with your eclipse setup. It works just fine for me on a very old dual-core Athlon machine. I mainly use Vim - which can definitely qualify as an IDE with the right plugins (the only things I need are "!make" and "!make run" but Vim can be very well integrated with ctags and gdb to get the full IntelliSense + inline debugger experience). 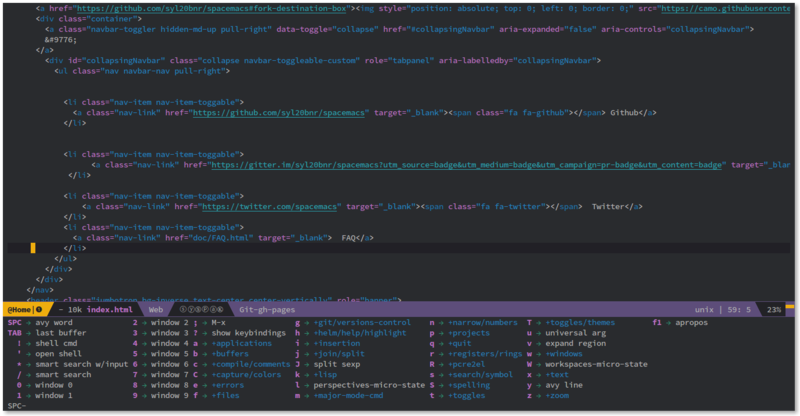 I ported Vim to ToaruOS several years ago, got bored with it, and decided my own editor needed to be more usable, so after a very dedicated week of hacking on it, I use that as well. @iansjack: In my experience, Eclipse scales to be slow on everything. Tell me about it. I recently started using Android Studio, "Powered" by IntelliJ, at work. And boy oh boy, the only thing that comes to mind is a server powered by a desk calculator's solar panel. I prefer to use VS Code (w/ Vim plugin) for other projects at work and on my OS at home. It doesn't match Vim perfectly, but it does a good enough job. My first questions for any new IDE is 1) Does it have a Vim mode/plugin, and 2) How do I uninstall it if it doesn't. "...not because [it is] easy, but because [it is] hard; because that goal will serve to organize and measure the best of [my] energies and skills..."
I have a question for the vim aficionados. Personally I'd use vim if it had mouse control, and context menus which facilitated discovery. These two things are, in my mind, the most important innovations in GUI design and the only things that are unambiguously better than anything that came before them. Do you prefer to do without these, or do you not consider them to be important? I'll be that guy and admit I use the mouse a bunch. IIRC with gVim you get mouse control, but its more natural when using Vim in an editor originally designed with the mouse in mind. Yeah you can use easy motion to always stay on the keyboard, but eh. For almost anything where plain text is mandatory (e.g. programming) or sufficient (e.g. personal notes), I use pluma (a gedit fork). I think it does the job for me without being a fully-fledged IDE. I write my PDFs in LaTeX, also using pluma. I however make an exception for MATLAB assignments, where I use GNU Octave instead of a simple editor. Note: I've also written some code under Sortix (I used the default Sortix editor), but that was hardly the 0.1% of all the programming I have done since I started programming in 2013. In university labs, we had used DevC++ for C programming and we are supposed to use Eclipse for JAVA programming. We have been doing UML stuff in Umlet, which I also disliked. I'm probably one of the few ones that dislike modern IDEs and OOP programming languages like JAVA (and to a lesser extent C++, but I'll admit I haven't tried it much).